Delta has rolled out its first uniform upgrade since 2006. Some 64,000 employees reported to work Tuesday attired in what the carrier is calling its “passport plum” look. Customer-facing employees, such as flight attendants and ticket agents, and below-the-wing workers, such as mechanics and ramp agents, have been outfitted in new attire, which Delta produced in partnership with clothing retailer Lands’ End and American fashion designer Zac Posen. Uniforms include unique details, such as the collar of the women’s blouse being inspired by the wing of an airplane, Delta said, as well as functional touches based on employee suggestions, such as passport and pen pockets. The airline is shaving an inch off the maximum heel height for the footwear of its more than 22,000 flight attendants from four inches to three inches, a Delta spokesperson said. The decision was based on feedback from employees and advice from a podiatrist, the spokesperson added. Delta said it collected 30,000 surveys from employees about the uniforms themselves. The minimum heel height for Delta flight attendants remains a half an inch, for when they are making their way to their aircraft, but they can change into flat shoes, including ballet flats, on board, where workdays are physical and long, from pushing heavy food-and-beverage carts through the aisle to helping passengers find coveted overhead bin space for their overstuffed carry-on bags. Delta flight attendants can also wear boots with pants and opt for different footwear altogether with a doctor’s note. Sales of high heels have slumped broadly, recent retail data show, amid concerns of the physical impact of these shoes as consumers shift toward more comfortable apparel and footwear. Men have similar requirements, and shoes must be solid, smooth black leather. No hiking boots, or ornaments, such as metallic embellishments. “These uniforms were built to keep Delta employees safe, comfortable and always ready to fly,” Lands’ End CEO Jerome Griffith said. Undoubtedly, Delta hopes the uniforms will be better received than the ones American rolled out in September 2016. Those uniforms spawned grievances and eventually lawsuits from employees who reported that they caused allergic reactions. As a result, American too has retained Lands’ End as it works to replace its current uniforms, which were produced in partnership with the clothing manufacturer Twin Hills. 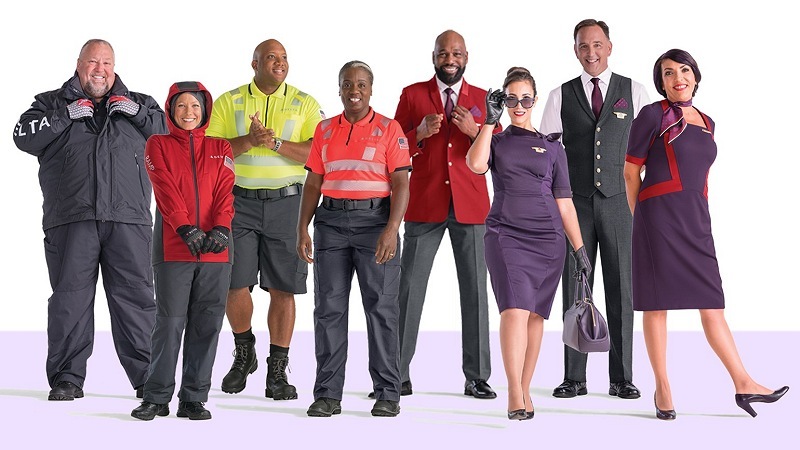 Passport plum isn’t the only lively name Delta is employing for the colors in its new uniforms. Employees will also report to work donning cruising cardinal, groundspeed graphite, traveling thistle and skyline slate.